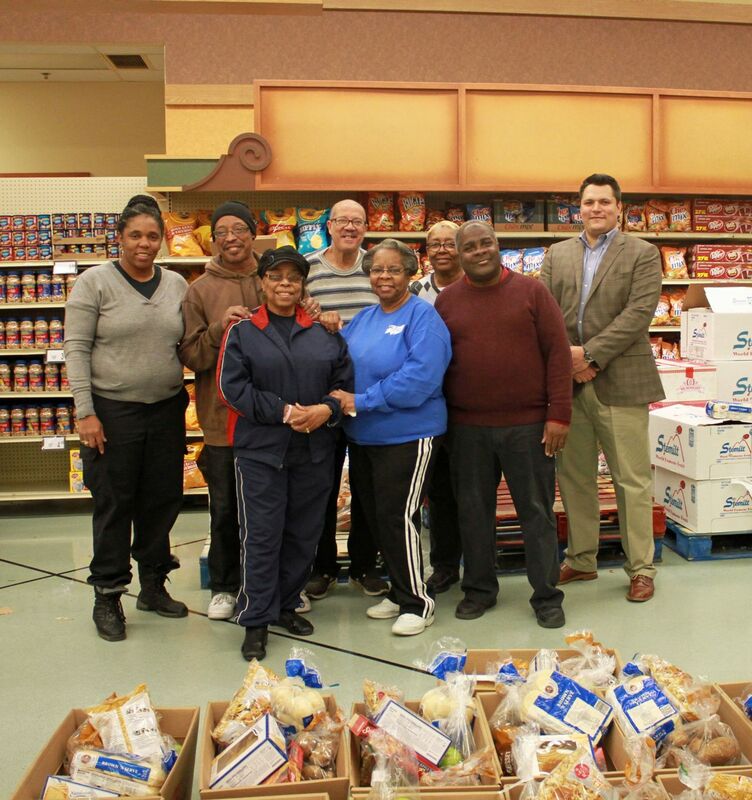 Hupy and Abraham Sponsors 2014 Thanksgiving Basket Giveaway | Hupy and Abraham, S.C. The morning of Wednesday, November 19, marked the 37th Holiday Basket Giveaway in Milwaukee sponsored by Hupy and Abraham, S.C. The giveaway allows people who are unable to afford the ingredients themselves to create a standard, traditional Thanksgiving meal. Hupy and Abraham shareholder Attorney Chad Kreblin was present to assist with the baskets, which feed at least eight people. Attorney Kreblin with the Holiday Basket volunteers. Two types of baskets were available to recipients -- a ham basket and a turkey basket -- both including many other items for a full and hearty meal. The giveaway originally had 100 people signed up for the baskets, but Tiaysha explained that Hupy and Abraham noticed the need had grown, and added 20 more baskets for this year’s event. Meanwhile, Tiaysha gestured toward the assembly area -- where volunteers laughed and bonded while bagging turkeys, hams, and assembling the boxes. “All the volunteers here have been here since 1996,” she said. Volunteers come from different organizations and are together only twice a year. The remarkable thing being that they still worked like a well-oiled machine. On her way out, Nancy shared her gratitude with Attorney Kreblin and embraced him before leaving the store. As time passed, people filtered in and out of the giveaway location collecting baskets they needed. Some were so busy that did not have a chance to stop and chat and had to return to the people they helped. Some people like Nancy took one basket for their family, or some like Maria, a teacher from Longfellow Public School, took multiple baskets for their organizations. As the giveaway ended, Attorney Kreblin said his goodbyes to the volunteers and they promised to reunite for the Christmas basket giveaway in a few weeks. Hupy and Abraham has given over $500,000 to over 100 worthwhile causes in the past 3 years and would like to wish everyone a safe and happy holiday season.